Suddenly there was a garden. Where there had been no garden before. It wasn’t much, a tiny grassed area, stone walled on two sides, just off the crooked shortcut path down to the main road. Not much, but it hadn’t existed the last time I’d walked down there. Granted, that might have been a month or so ago but not too much more. I was in a rush, that Saturday morning when I first stopped and looked down into it, still I couldn’t resist easing my way down the slope to stand in that secluded, green, enclosure. I say ‘enclosure’ but, really, it was only enclosed on three sides being open on the fourth to my shortcut pathway above. The two stone-walled sides were high and neat and the third side was made up of dense hedging which separated the area from the busy main road just beyond. 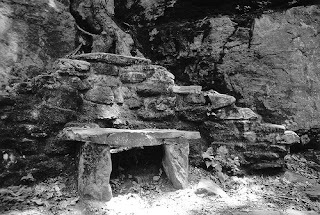 The garden was empty except for a small dolmen structure which seemed to serve as a bench. I stood for a moment, wondering what this garden was and how it had appeared so very suddenly. My appointment was at the library so I dragged myself back up the steep bank, down to the main road and hurried across. Meeting, as I was, the Chief Librarian, I couldn’t help but prod him for a little information about this newest corner of my housing estate. “The Council got a little money and did it up,” he was happy to confirm, “apparently it used to be a mass grave for the people who died in the Influenza Epidemic of 1918. So it was a memorial. A long-overdue marker for poor people who passed away in terrible circumstances so many years ago. That was a good thing and, in the short term, it made me feel good. Things that make me feel good often turn sour in the clammy heat of a deadline. Good ideas can be perverted when the mind-call for a story remains unanswered. That’s how it was on that November Thursday night. The newspaper deadline was the next morning at eleven. And I had nothing… nothing at all. Eight hundred words were required, as they were every week, on ‘Local Colour’, whatever that was. The gig only paid pocket-money but it was all I had at that moment and the self-esteem alone - of having people in the street talk to me about my column - was worth quite a lot. My mind turned to the 'Sudden Garden'. I had known all along that there was a column in it, an easy one too, but I needed Colour. My job was to divert and entertain the readers, in between all the endless budget cuts and lost football ties, and some old mass grave wouldn’t do that… not unless there was an angle. I turned to the Internet, as I do for so many of my needs. The angle was not very hard to find. It was raining and blowing hard at five minutes to Midnight. I had slipped on the grass bank which led down into the little garden and now my back was wet and doubtless caked with mud. I stood as close to the middle of the space as I could and I listened. There was only the wind whistling in the stone wall and the patter of huge drops on my hood. If there were cars whizzing past beyond the hedge, as there always was, I could neither hear them nor see any hint of their lights. I was utterly alone in the darkness, which was exactly what I needed for my plan, but which was still not terribly nice. A quick read on the net had reminded me that the world-wide folklore attached to mass graves is legion. The huge curve in the District Line in London was formed so the route could avoid a Plague Pit (untrue). The Black Death virus still lives on in the ground of those areas (untrue). And then there was the one I had decided to build my story around. I had first heard it on a Ghost Walk around the perimeter of St Paul’s Cathedral in London many years ago. It simply affirmed that, if you stood on a plague pit site at midnight and put your ear to the ground, you could hear the crying of the poor souls beneath… and the hearer would lose his mind. Utter rubbish, of course, as were all the rest of the tales, but I knew my readers would lap it up. Some would even write-in and berate me for my lack of respect in doing such a terrible thing but that would be a bonus. Controversy is good, after all. I shivered and checked my watch which thankfully had a luminous display. Two minutes to Midnight. There was no actual requirement that I do this thing on the exact strike of twelve but it seemed to add to the authenticity of the piece if I did and I was all-about the authenticity then. I decided on a quick trial run. I got down on my hands and knees. The new wet grass immediately soaked right through to my legs. Slowly and, it must be said, quite tentatively, I pressed my ear hard to the grass. A finger, cold and limp and far-too skinny, turned wetly beneath my earlobe and caressed me. I screamed, leaped up, and shone my little torch down. A worm, purple and bloated, sailed with surprising elegance back down into the soft earth. I laughed nervously to myself. And then it really was midnight. At first I felt only foolish, lying on the ground with my ear pressed down. I prayed nobody would see me and hated the feel of the wet invading me from so many different angles. But then I settled and, despite the wind and the rain and the ludicrousness of the situation, I listened. And what I heard was the plight of those who lay there. All those stories I had scanned about the Pandemic, the tragedies I had clicked past to get to the frothy gore, they all came back to me now. The young men, the pregnant women, the vulnerable who had died in their millions. There was nothing to actually hear, of course. Only that world of pain for me to feel. The old legends had proved themselves almost true. By putting myself in that position, at that time, I had opened myself to all those people who had died and they had spoken to me. I had not lost my mind. In a way, I had found it. As I trudged home, I resolved to abandon the column idea. There was a lady on Upper Street who owned a white cat who had produced five black kittens. For this week, that would do. Fabulous story! I hadn't heard of plague pits before I moved to the UK in 2007 and asked my uncle why nothing was built on Blackheath. He did actually repeat the plague-still-in-the-ground angle to me which I didn’t realise was a myth. It is amazing how history sometimes rises to grab our attention. I remember reading about Boudica as I travelled around Scotland and North England last year. I don’t think I was anywhere near where she had been but the descriptions of those landscapes and events, coupled with the scenery around me, really made an impact on me. Hope: Great work at your own blog yesterday, well done mate. Jim: Got that. Thanks for spotting it. Really enjoyed this. I've had crappy deadlines in my time and this gets a lot in a tight piece. hope to see you at my blog too!